B. Todd Jones was recently sworn in as Director, Bureau of Alcohol, Tobacco, Firearms and Explosives (ATF) by U.S. Attorney General Eric Holder. B. Todd Jones was recently sworn in as the new director of the Bureau of Alcohol, Tobacco, Firearms and Explosives (ATF). 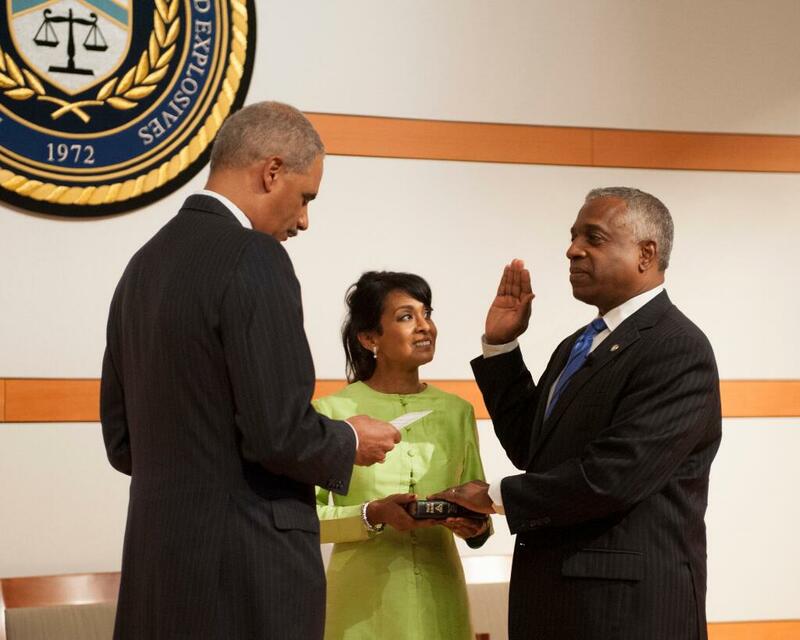 Jones was sworn in by U.S. Attorney General Eric Holder on Thursday, August 29, 2013. From August 2011 until late August, Jones had been the bureau’s acting director having been appointed by Attorney General Eric Holder. He was confirmed by the United States Senate on July 31, 2013 after having been nominated to permanently fill the position by President Barack Obama in January 2013. There was a ceremonial swearing in at The White House by Vice President Joe Biden and the oath was given a second time at the ATF Headquarters by Attorney General Holder. Jones served as both ATF Acting Director and U.S. Attorney for the District of Minnesota until his confirmation as ATF Director. Director Jones had been one of the first to be confirmed as a U.S. Attorney in the Obama administration on August 7, 2009. He had previously served in the same capacity under President Bill Clinton from 1998 and he served in that capacity until January 2001. In between his time as Minnesota’s top federal prosecutor, Jones practiced law at Robins, Kaplan, Miller & Ciresi L.L.P., the firm headquartered in Minneapolis. Mr. Jones received his Juris Doctor from the University of Minnesota Law School in 1983 and his Bachelor of Arts from Macalester College in 1979. He also served in the U.S. Marine Corps, as an infantry officer, and as a member of the Judge Advocate General Corps. This entry was posted in Latest Stories and tagged ATF, B. Todd Jones, Bureau of Alcohol, Department of Justice, Director, DOJ, Eric Holder, Firearms and Explosives (ATF), Tobacco, U.S. Attorney General Eric Holder by Chris. Bookmark the permalink.